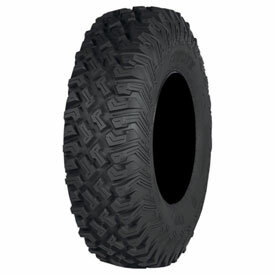 Specifically designed for high horsepower UTV and SxS vehicles, the 8 ply rated Coyote tire is a radial performance tire that is compliant with DOT standards and proudly made in the USA. I didnt exspect much being the stock tire but i am impressed. Excellent traction in dirt. Smooth as silk on pavement. Very low road noise. I've run many different tires, from bighorn to regulators to outlaws. These are my favorite so far. What is the height (mounted on 15x7wheel) and weight (tire only) of 32x10-15? BEST ANSWER: These measure 32" and weight is 44 lbs.